Please do not reblog my post. Apologize for this; this is not to my liking. There is a blog which reblogs almost all my posts, trying to duplicate mine. While some reblogs publish my avatar and link back to my site; other reblogs only have wordings which state the post was BY the Reblogger ( with no mentioning of my blog or providing a link back ) and I am only credited for the photo as a Source. Some blogs now have lost their meaning, they do nothing other than collecting and reblogging other people’s posts. I do not encourage this non creative form of blogging. Some shamelessly reblog ( content scrapping) every day dozens of posts at no time immediately after they are posted without really reading the posts – this is a disrespect to the original bloggers. Their only motive is to increase their own popularity and boost their number of followers. There was one blogger who used to reblog my posts onto his so that he can make money out of his advertisement. There is no control on the extent and how the reblog is done. In my communication with one of the Rebloggers, he has declined not to reblog my posts. Under this circumstance, I have no other option but to remove the Reblog button from my blog. In case there are posts you really like to reblog, please communicate with me and I will look into it case by case. 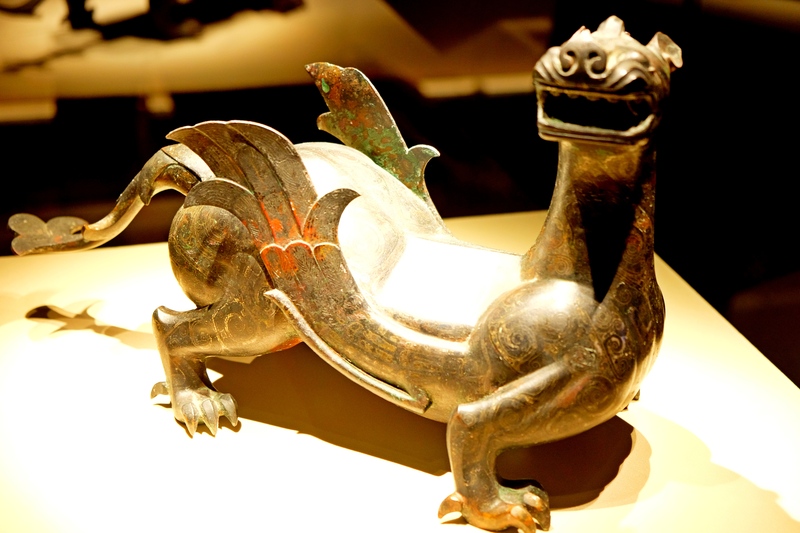 Below is a relic found in the Terracotta site in Xian. Yes, I have people who reblog the entire piece instead of a few lines and referring them to my blog, as well, but appreciate those who do it in the correct way, referring people to my blog. WordPress seems to reblog posts differently and there is no uniformity. I don’t like seeing reblogged posts that do not even publish avatar of the original blogger and that the reblogged posts are used with other objectives in mind. Thanks for your support. I don’t blame you for removing that feature, I dislike reading blogs that don’t have original content. I love seeing your photographs, they are a wonderful addition to my days. I look forward to seeing lots more. Hi Kate, thanks for the support. It is sad that we are seeing more blogs which lose their original creative thinking / writing / photos. That is awful that there are people essentially stealing your work. I love seeing your photos! Yes, we can only control that part we can exercise control and that’s the reason I deleted the Reblog button. Thanks for the understanding, Mel & Suan. Hi, I will keep on blogging. Thanks so much for the support! I noticed that a couple of times too. Filter that site if you can. Maybe you should also report it and see they get shut down or warned. I will do it if situation gets worse. What a shame you have been forced into this action by unscrupulous bloggers! I hope you will contnue posting your beautiful photos. They make my day! I would not be put off by these people but will continue to post. Thank you, higginsmj! You have to do what you must to keep plagiarists at bay. I understand your reasons completely. Hi Kevan, thank you for your understanding. I had a problem with a blogger that reblogged. Because Word Press does not show any text in the text box for reblogs, she thought it had not worked. So, she copied the entire post and ADDED TO THE CONTENT as if it was in the original. The problem with her additions included interjecting her opinion that was inconsistent with the post making it sound down right hateful. There are some people who copy posts and do not give attribution in hopes of forcing DMCA take down notices. Their hope includes that bloggers do that themselves rather than through a lawyer so they can get the blogger’s personal information and then use it inappropriately. I see some bloggers who copy and paste from other material for their entire posts, and never give attribution to where they obtained the information. Here lately, I see about 3 bloggers blog the same, identical post without any attribution. It’s hard to tell where it originated. I’ve noticed too that there must be a new widget or program that allows bloggers to program likes to their posts without their followers actually visiting and/or liking. I’ve unsubscribe to 2 blogs recently because of that. I suppose we will never be able to stop these people. Disallowing reblogging like what I have done is only a passive way of dealing with this. If they opt to spend efforts to copy it from my blog, I guess they can still do it. There are at least two guys out there in WordPress who shamelessly just press the Reblog button and reblog dozens of post per day without any attribution. Why people have to cheat to give more Likes to themselves, you can cheat others, but not yourself! I agree. It’s annoying and thoughtless. I don’t have a reblog button on my posts but a person copied and pasted the link with some text from two of my posts. They did acknowledge my work but their commenters didn’t. They reacted as if it was that person’s writing, even though it was only an exerpt. Weird. Yeah, there is no way of controlling how other people will be using your materials. Many readers can’t distinguish which part / or whole were from the original writer. My photos have also been stolen for advertisement purposes until I find out. . . . . not a very good situation. I always edit my photos to a really low resolution so they’re useless for anyone else to copy. Some people have no ethics. Hi, I never know how to downsize photos. Do you have any recommendation as to the software and the means of doing it ? Thanks in anticipation. I am sure some people are downloding my photos. I don’t have special software. I have a Microsoft Surface Pro 3 and I use the Microsoft program that came with it. I click on edit and resize. I always resize images to a horizontal pixel measurement of 650 which loads fast but isn’t too small on the screen. I’m no expert but this works well for me. The images would never be printable and wouldn’t look great much larger than what I have on my posts so I figure they’re not much use to anyone else. Good luck! I hope it makes a difference. Michael, this may not be relevant to you because you specified a free alternative. However, I use Lightroom as my primary editor which has an excellent export facility. I use presets which contain settings for destination, file renaming (not for WordPress publishing though), image format and quality, image sizing, output sharpening, metadata and watermarking. I can also export directly to WordPress.com so I don’t need to export the files to my hard disk first. I also use JpegMini which automatically compresses jpegs with no loss of quality. Not cheap though (though I did get it on special). There must be many free utilities that allow export to jpeg (though I have no knowledge of them). There may not be so many that allow presets so you can export in the same way without having to specify the details each time. Murray, many thanks for your sharing of this information. I will look into it. At the moment, I am just using free software which seems quite handy. Lightroom Classic CC (as it is now called) is $US10 per month bundled with Photoshop though that may vary somewhat according to where you are. There are many Photoshop substitutes but currently no real Lightroom substitutes. MacPhun and Aurora say that they will be producing ones “soon” which will be cheaper than Lightroom and not subscription. (You can still buy a stand alone version of Lightroom but it is hard to find on the Adobe site and will soon no longer be updated). Some people also use Capture One. In broad terms though, Lightroom is I believe the most powerful and easy to use photo editor (and organiser) with a great profusion of learning materials including free videos from Adobe’s Julianne Kost. Many thanks for your detail information. Murray, unlike you, I am just taking snap shots and not much into post processing. I am sure my readers will find your information very useful. BTW, have you published any books? … of course, if your free software works for you and you don;t need anything else, that’s great. In 1987, I travelled around Australia photographing lighthouses with a large format camera and Have 95 images in “From Dusk Till Dawn, A History of Australian Lighthouses”: http://www.bookshops.com.au/isbns/033347709X . I have already browsed the images of lighthouses in your blog, they are real professional. Have to peruse your book as well. Sorry to hear such practices exists and that your beautiful pictures were exploited. Hi, I think we should avoid or prevent our intellectual property from being misused by others. My method is only a negative move as I cannot take control of what others can do. Thanks ! I also hate it when people reblog…it is not their work and to me it is like stealing.Glad you put a stop to this. Actually this has been happening to me for some time. Every time someone reblog my posts, I’m always not quite sure how to react. Should I be happy that my posts reach more audience? Or should I be worried because some of those bloggers have only reblogged posts on their blogs, as you said. This post of yours definitely got me thinking of it. It seems like no matter what a person does, other selfish and inconsiderate people are ready and willing to use that person’s work for their own advantage. I’m sorry others have created this problem for you, but we are all glad you will continue your blog as we enjoy your wonderful photos and commentary! I certainly understand. I’ve had people do that to me as well. Good for you for being very upfront about it. I am surprised that there are not more people like me who speak out on this subject while their posts / photos are subjected to being “stolen”. Thank you for writing in, Elyse. Hi Michael. I notice that when someone reblogs one of my posts I have to approve it. Does that “approve” option work or is it already reblogged and posted whether or not I click on approve (with a check mark)? In my case, my post is automatically reblogged once somebody press the Reblog button on my post. Retrospectively, I got a message which says that my post has been reblogged. If the Reblogger adds some comments, it will also show as a Comment which I can Approve or otherwise. There are at least two guys out there who reblog dozens of post daily for their own motive . . . . . . a sad thing to see. My view is we should resist it instead of just accepting it. . . . . hope reeducation helps. Now you can see this proliferation all over in the Reader of WP. Yeah, you are welcome to contact me for any reblogging, Arati. Very sorry to hear that some dishonest people are trying to take advantage of your beautiful work! Only you deserve the credit. You made the right decision, Michael. There is not much fame here. I have got less than 12,000 followers whereas one of those guys who continuously reblog others’ post without acknowledging gets over 120,000 followers. People use “Publicize” on their Word Press blogs that combines the number of followers on other social media to the number of blog followers. When bloggers have Twitter and/or Facebook that allows for purchased followers, the number of blog followers might appear to be massive. By the way, when you see a link below the photo on a “reblog” it’s not a reblog but rather, Press This. When other bloggers use Press This is also when you get the notification to approve a Ping Back. Blog administrators have no option of turning off “Press This” for other bloggers. Press This operates on any website. It captures the title, the link, and a few lines automatically. However, a blogger can highlight an entire article and publish it in full. I’ve done that myself but I also edit to say that I published using “Press This” at the top of posts I publish that way. It does give attribution so there is no worry there. I don’t use it very often either. There are a few blogs I follow that began using Press This and since it was nothing more than a link to where the original article is found, I stopped visiting their “Press This” blog posts. Personally, I think it’s WordPress’ answer to Twitter. A study found that only about 1 percent of links in tweets are actually followed. In other words, bloggers are wasting their time thinking that using Press This is favorable to their followers. Great to learn all this from you. Thanks, Xena! Michael, I am so sorry you have had that experience and frustration. I’ve only been blogging 5 years, but about a month before I opened it, I read everything I could on how wordpress operates. Of course, Word Press has made changes through the years. For example, there was a time when you could reblog, send to Twitter or Facebook through the Reader. That function is no longer available. People who blog more than twice a day are doing themselves a disservice if they truly want their posts read. When their followers use the Reader, the reader lists posts published within minutes of each other giving little more than the title of the post. Hi Xena, you are right. For this reason, I am trying to limit myself to publishing only one post per day. Previously, WP showed a big picture of your photo ( plus maybe smaller pictures underneath it ). Now, they show a truncated panoramic version of your photo if you just publish a photo without any accompanying text. That suited me, as for several years, I have no time to write and just showed my photo. Once you add text, all WP gives you is a tiny space for the photo plus a couple of lines from your text alongside of the photo. I rather like what WP had previously. Years ago, WP did not have Rebloggers who reblog dozens of other people’s work at no time; the good thing is now the dozen or so reblogs are bundled together and few people actually open and read those reblogs one by one. You seem to be very observant on what’s happening on WP. If you want a large image and no text, check the “image” format next to the text box. It might be defaulting to standard. You can also play between the two to see which works best for you. You are so right about the “bundles” on the Reader. If there’s more than 3, I scroll pass them. If you publish more than one post a day, just make sure there’s time between them. That way they will appear in the reader separately. I enjoy your travel photos, and how you candidly shared news about your mom. You’re REAL, and I respect that. You are right, if you allow sufficient time between posting, the posts may not be bundled together. I like speaking / writing out what I think / see and I have a great love for my parents; in that sense, I am a real person. Thanks for your kind words, Xena, much appreciated. Wow! Still you have an impressive following. My current count is a bit under 700. I am sure many of them are dormant; in fact, I don’t know what Followers actually mean and whether they receive a notification when I post ( think there are two types) but I wouldn’t be bothered. I don’t know a lot about how that works either. I still have a lot to learn. You’re doing better than me, Michael, in terms of followers. I also have been blogging for six years since I retired and have just over 1,000 followers. I’d probably have more if I just posted single images each day rather than less frequent posts with many images and often detailed discussion of their context – but I have no interest in chasing those numbers. I suspect many people have quite limited attention spans. I also don’t think followers to the Reader count much – most probably never go there – only email ones. For the last 2.75 years, I have been fighting cancer with my mom and didn’t put much effort into blogging. Personally, I like more text to go with multiple pictures in one post, but I couldn’t afford the time and effort. Now that my loving mom has passed away, I can spend more time travelling and preparing posts. I don’t care much about number of Followers too. I think, at any one time, there maybe only 200 of them, instead of close to 12,000 as reckoned by WordPress for my site. You are so wise, Nia – I wish I have done it earlier. But I am not surprised. You did well. My Bro, I wrote to some of them and they refuse not to reblog my post – forcing me to remove the Reblog bottom. If you go to the Reader, you will find the same people reblogging dozens of other posts and state at the top of the posts they were BY Him! Sigh . . . . . . . I seldom reblog. I have found that readership is low. When I do, it shows up as “originally posted on…” So to me it is quite clear that the “authorship” is not mine… Also only a very brief part of the post is displayed. Maybe it depends on the theme? You are right. WordPress has a lot of themes. For some themes, on reblogging, it shows my avatar and the link to my site – they are very clear and I have no problem with that. Unfortunately, some themes just show on top BY The Reblogger and nothing else, only indicating the source of the photo at the very bottom. You might want to send a suggestion to WP? WP should have noticed it, there is now a proliferation of auto reblogging without any attribution on WP. Everyday, you can see someone reblogs dozens of posts a day on WP with their reblogged posts only showing they are by By The Blogger. Surely, they are infringement and should be dealt with by WP. Didn’t know that. I will keep an eye open. I am not sure why I have ” followed ” some of the auto Rebloggers, last night,I reviewed my following list and deleted those people out of the list. For those who have the time and want to put in the effort, I found an article about this subject that gives good advice. I did write to one of the Rebloggers. He refused not to reblog my posts ( with no acknowledgement) unless I remove the Reblog button. It’s happened to me a few times and the blogger appeared as you say. If it happens to me as much as you I would remove that button, too. Authentic expressions of who we are, and sincere engagement with others is the way to grow a blog. Yes, it’s not easy though. In fact, I have more courage when writing to an unknown global audience, I just write as if it is just to myself. I knew exaclty who you were speaking of when you wrote this as he reblogged many of my posts and added his own picture as the headline of it. He spent a good month bashing me on his blog and I looked and yep, it is him. He has written about you now on his blog. WordPress won’t take it down though. Apparently wordpress allows slander to other bloggers which I find completely unacceptable. Totally seperate…I adore your blog pictures and have enjoyed looking at them for some time now so thank you for posting them. I have actually had one blogger take one of my photos and say it was him. He finally credited me for it. It is highly disrespectful when I write personally about my experiences and my life and then have that violated is just…well, wrong. I’m sorry it happened to you. I will keep looking at your pictures as they are calming and beautiful. I am completely ignoring him and have taken him off my Reader so I am not aware of what’s happening. I suspect he has an auto method for reblogging other bloggers’posts. Yes, my photos are usually a bit calming – something I need and like to share with others. I found with dismay that many of my photos now end up in Pinterest too. Good. You are wise. I did not know to ignore him at first and apparently fueled the fire. I am ignoring him now. I wish that I would have felt honored to have someone “steal” my photograph that they loved it but it felt very violating of a personal experience that I had with this animal I took a photograph of. I try not to let it get to me anymore. Sometimes it is a challenge. I like to look at your pictures before bed as to see beauty before sleep because I feel it is important to the soul. It is in fact why I take photographs in the first place although not a professional like you, just a hobby but I do enjoy finding beauty in the world and sharing it. I now realize that you speak out on Abuse – that needs courage and a sense of righteousness which i deeply appreciate. I am glad to hear that you look at my pictures before going to bed. I am not a professional photographer. I just took up photography again after retirement. Yes. I am an abuse survivor. An entire childhood of multiple abusers. My blog is about overcoming the shame that is put on the victim by the perpetrator and finding beauty and peace again. I write a very honest yet raw blog about details and truth to bring awareness to others on the challenges we face every day. Thank you for appreciating my words. You may not be a professional but your work is quite amazing! I am currently on the look out for a camera that I can use that is light weight due to the weakness in my arms because of a muscle disease I have. I would like a zoom lens but they are also heavy. I am on the search though. My trip to HuaShan with difficult climb also makes me thinking of buying a smaller camera with a built in zoom, I am sure they exist in the market ( or I can use my wife’s camera ). What a shame. I have experienced this a very limited extent but I would imagine someone with many, many followers like you would be appealing to a lazy blogger! What I found out is that he collects maybe hundred of the better blog posts everyday and show them on his blog with lots of advertisement. Many of his readers are not aware or do not care that the posts are from others. He gets a good following and good money from his advertisement on his blog. I read your post and was horrified. Since all I do is post photos and “like” photos, I never thought someone would take another’s words and try to pass them off as their own. It takes a big person to admit that someone else is able to present a topic in a way that did not occur to them. Because of that, you want to let others know about this person. Guess that’s my naivete getting way of realizing that there will always be someone out there trying to be someone they are not. Is it possible to name these bloggers that grab material from others and pass it off as their own? Could a “Material Misuse” blog be created and linked to the culprits? It seems a shame to let them be able to continue their thievery unchecked. I spotted them on my Reader – not sure how this guy got onto my Reader as I didn’t follow him. I spotted others when googling my site / name. Since then, I have unfollowed him in my Reader. I just don’t want to know anything more about this guy but will not take further action. Life is too short for me to do this. Thank you for your suggestion anyway. I haven’t had any problems with reblogging but I have had a worse instance where a commercial site has extensively used my images of Easter Island after removing the watermark. That’s not a case of talking to them, it’s a case of talking to a lawyer but I have yet to get around to that. I like your photos very much; they are of their own class while mine are just amateurish. No doubt, some people will steal your beautiful pictures. I have been talking to this guy who just do content scrapping without bothering to see how his reblogged posts look like. – no link back, top of post said it was by him when he reblogged the whole post. He continued to call me dumbass etc in his post. One day, when I got fed up, I may go to the DMCA. I agree. I have had my YouTube videos stolen and uploaded on Facebook by some one promoting a concert at his establishment. In principle I have no problems with some one using my work for this purpose, but, all I get in return for my efforts are likes, views and comments. By copying and uploading the copied video to his business’s Facebook page, this person is denying me the only reward I get while he could, with less effort, just link the promotion on Facebook with the url to my video; I do the same thing when I reference my videos in WP and FB. I didn’t want to resort to a DMCA takedown against a small business owner, but if he does this again; I’m ready, forms in hand. In reblogging I don’t understand why the post doesn’t automatically take the reader to the original post; it’s almost as if the system was set up for theft. Greetings Mr. Lai. In my view, Word press also has a responsibility for posts blogged here. Firstly, they don’t suppress Contant Scoping. Secondly, for many of the themes available in WP, if readers press Reblog, they don’t show information of the original writer or their link. I don’t want to waste time with WP or DCMA so just delete my reblog button. Oh wow. I had no idea people were doing this kind of thing with other people’s blogs. By the way, I love that ancient terra cotta piece you posted. I am not against reblogging – but then it should not misled reader thinking that the post and pictures are by the “reblogger”. There should be an acknowledgement at least of the name of the one who originally prepared the post with a link back. Unfortunately, this doesn’t always happened. It always seems it’s the few who spoil it for the masses … but I understand your frustration. Good points in a comment above about WordPress taking some responsibility to make sure themes that have the reblog capability also do so with attribution. Your creativity should not be used to prop up another’s creative void. Hi Kat, the “Reblogger” has ceased to reblogand left WP altogether, even his last post was removed. Not sure what happen! What a shame. People spoil everything! This guy’s left WordPress now!